Punctures never come at a convenient time, do they? You’re rushing to work, out on a ride with friends, going to a rally, or trying to get to the ferry on time and BANG!, there goes your expensive tyre and your day out! The cost of a new tyre after most punctures is also something you can’t always budget for, and the time wasted at the side of the road, getting dirty, wet and cold or just waiting for your rescue service to arrive is never recoverable. It can even be a killer with a blow-out at speed! So, What’s The Modern Alternative? SureTyres will install Punctureseal into your tyres and this will maintain optimum air pressure at all times. It will instantly seal most punctures and dependant on the severity of the wound, usually creates a permanent repair for the life of the tyre, greatly increasing safety and reducing tyre costs. 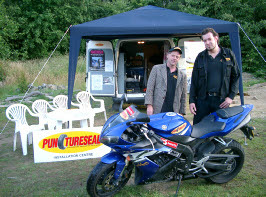 Let SureTyres Condition Your Tyres With Punctureseal Now! Call us now with your tyre sizes, for a no-obligation quotation for your motorcycle, scooter, trike or trailer that has pneumatic tyres - with or without inner tubes! Our Service is cost effective, fast and efficient and performed at your home, place of work or any convenient location in minutes. Our system does not void any manufacturer’s warranty and is guaranteed to seal up to a 6 mm stabbing object in the legally defined tread area of the tyre. 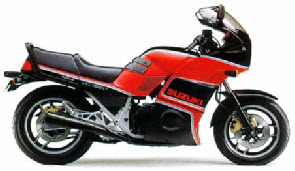 We provide a regular installation service to motorcyclists at Rivington Barn, Horwich nr. Bolton almost every Sunday throughout the year, so come and see for yourself how well it works! Nick Sanders did and get your tyres sorted before you have a problem!